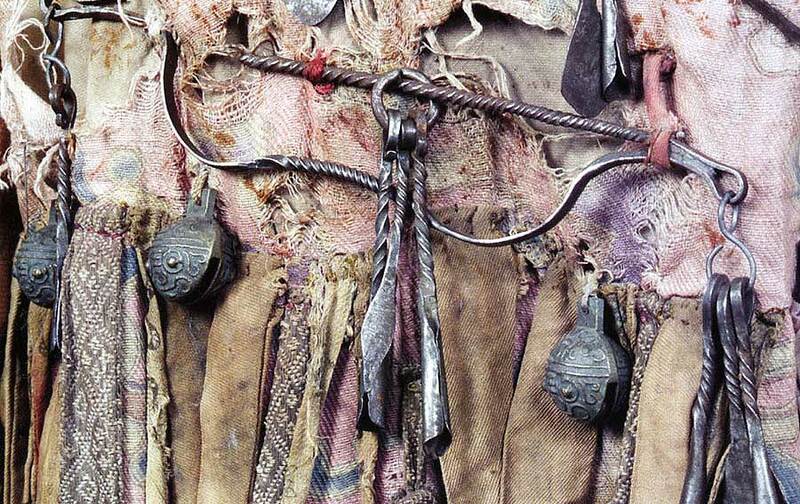 Below: Tiger Bells fixed to a shaman's costume together with an iron bow and arrow. 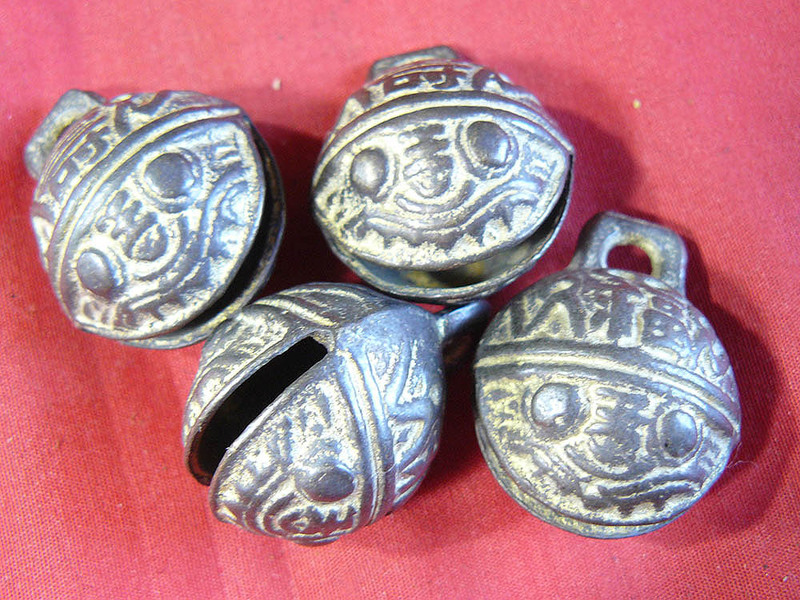 Shaman's in Asia, Central Asia and Siberia use many different forms of bells and jingles, often on thier coats or tied to other objects. 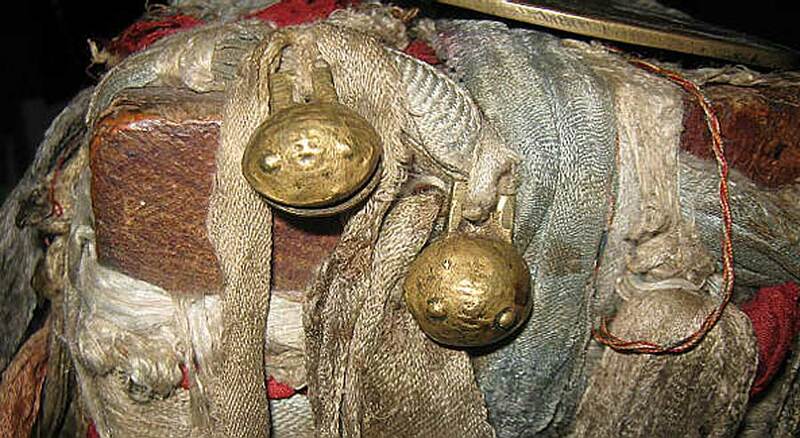 In Nepal chains of bells are worn across the shoulder, and in Mongolia and Southern Siberia tiger bells and metal jingles are often used. 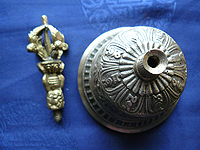 Above:Tiger Bells and iron and brass objects which jingle, fixed to a shaman's coat. 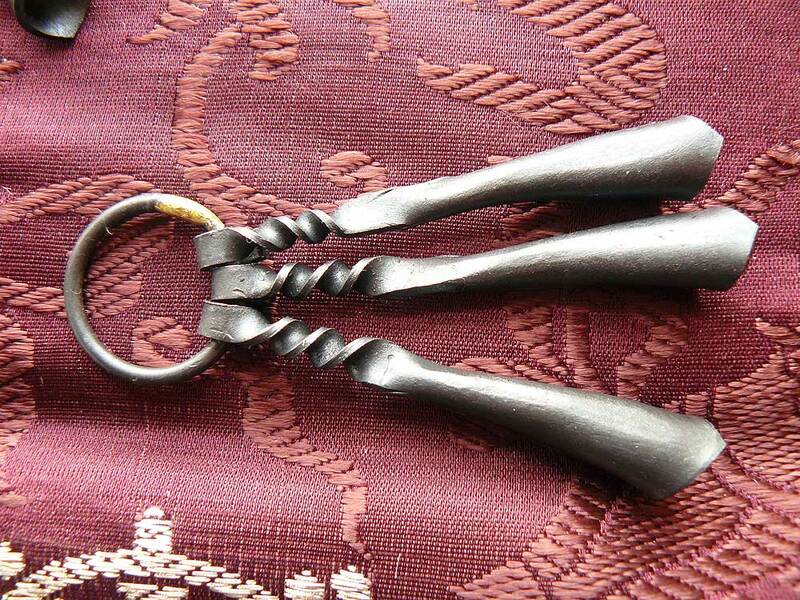 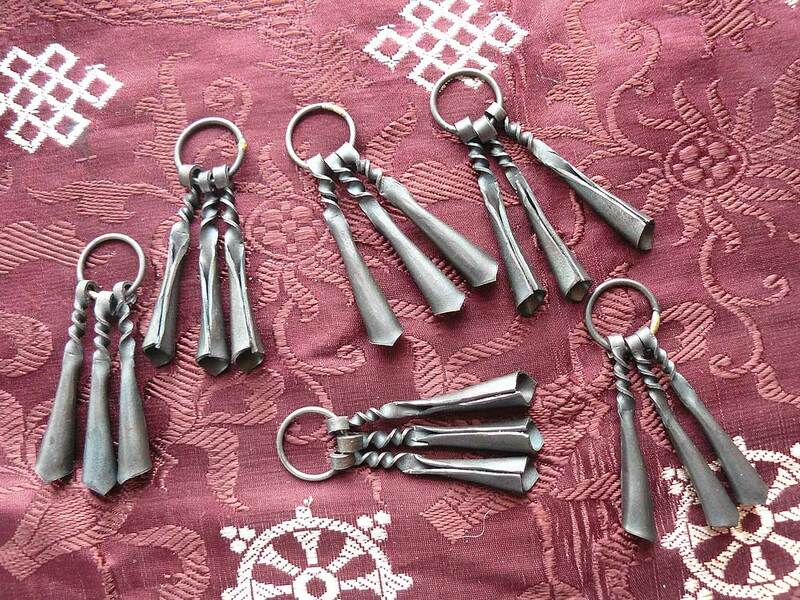 A set of three hand-made iron shaman's jingle cones, fixed on an iron ring. 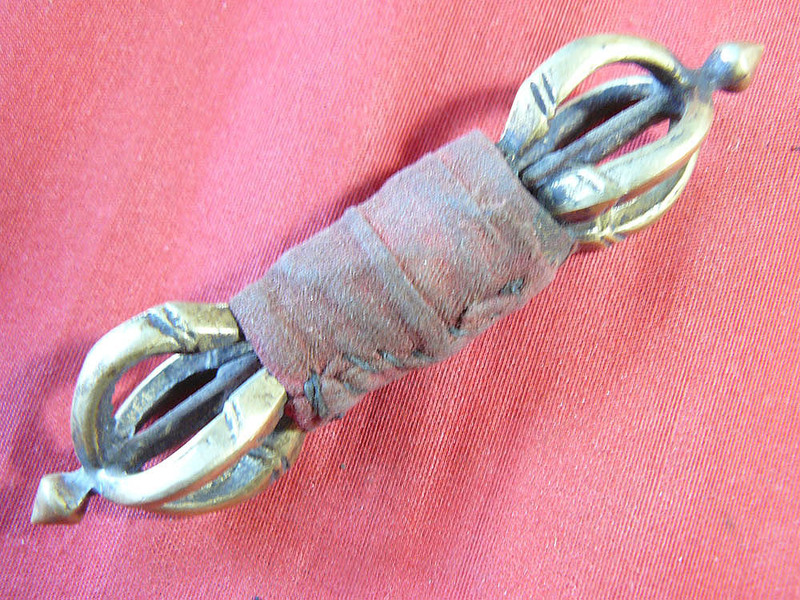 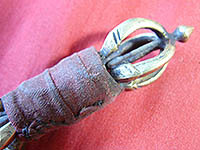 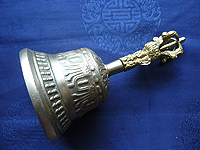 Jingles like this are used all over Siberia and Mongolia tied to costumes, drums and other objects. They are part of a shaman's armour and they are said to being life to objects because of their movement and jangling sound. 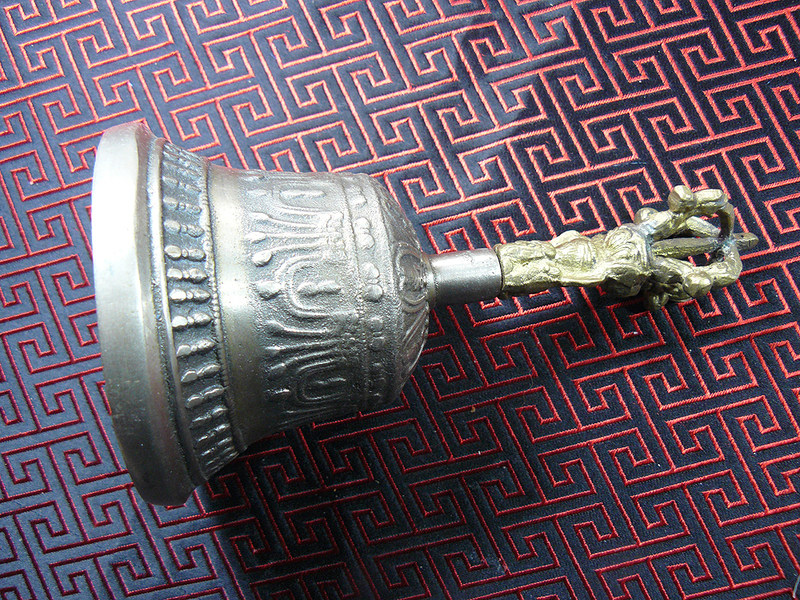 These cones are hand made in Ulaanbaatar in Mongolia. Above: jingle cones attached to the side of a Buryat shaman's drum to represent the drums ears. Found all over Asia, from the South right up to Siberia, these brass bells are always associated with shamanism, protection and magic. 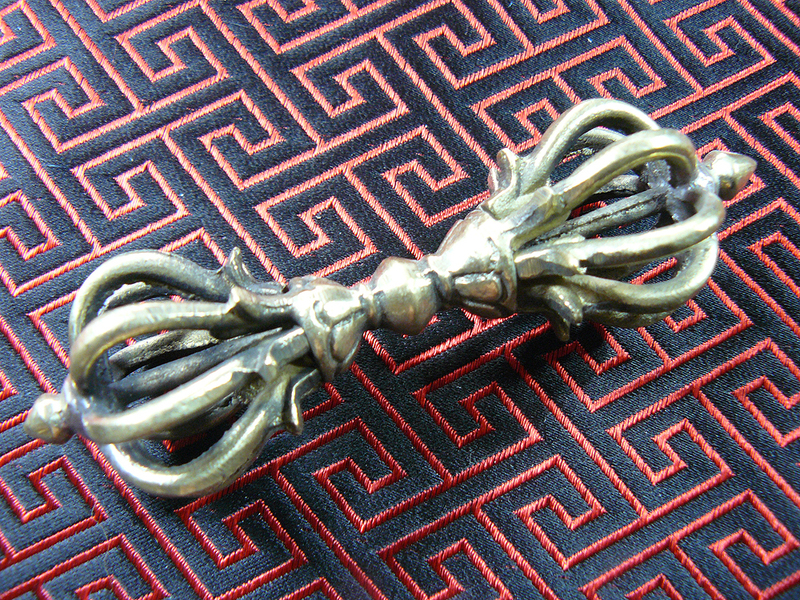 They are prized by Siberian shamans, who sew them onto their coats or tie them to ritual objects. 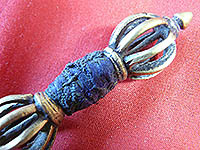 In other cultures they are tied to children's ankles as protective charms or worn around the neck. They have been made for centuries and although are not easy to find are still being made. 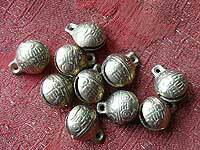 The design of Tiger Bells vary but the ones offered are fairly typical. 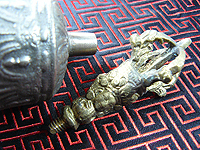 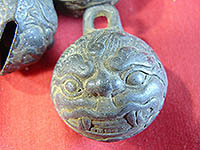 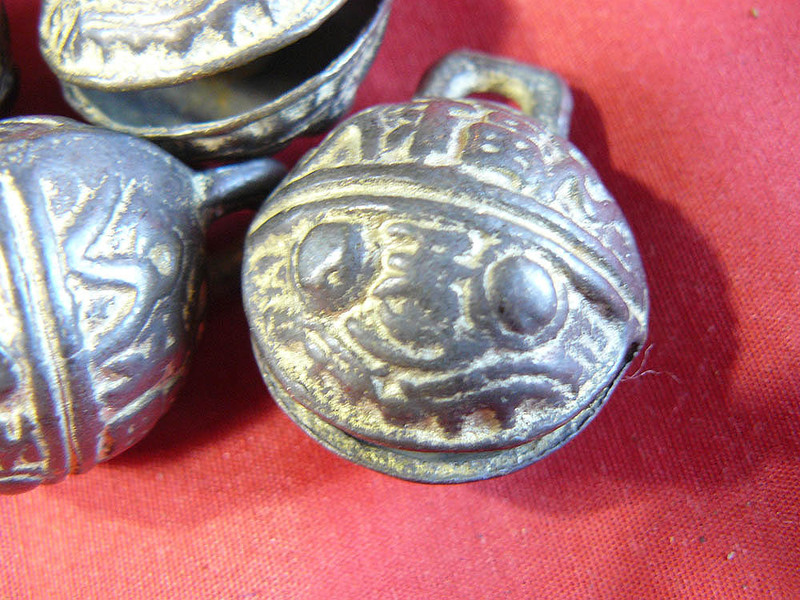 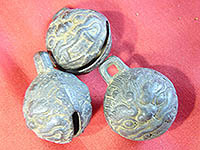 large, well detailed tiger bells with an old look. Very limited supply. 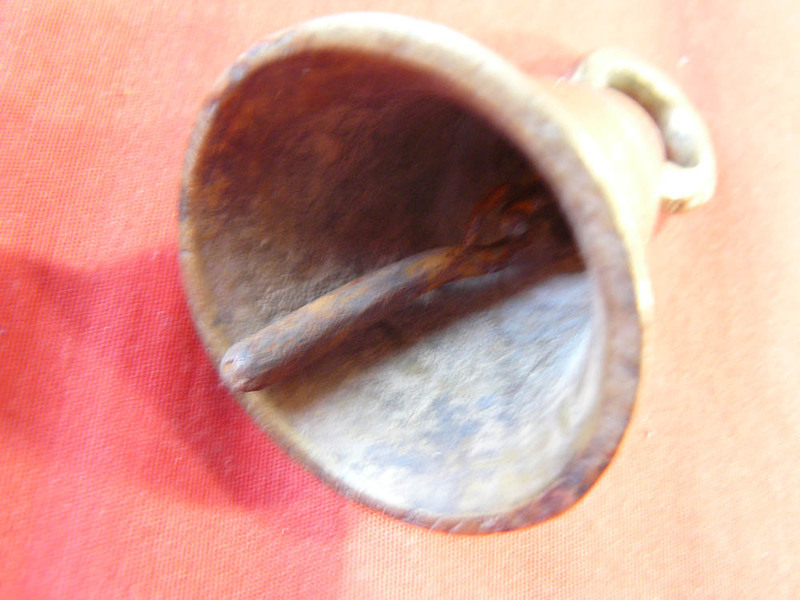 Bells (Ghanta in Sanskrit and Dilbru Tibetan) are used in Tibetan Buddhism together with a ritual thunderbolt (Vajra in Sanskrit and Dorje in Tibetan). The bell has a stylised eagle claw at the top. It representing female - emptyness and wisdom, and the dorje - with eagle claws at both ends - representing male - form and compasson. 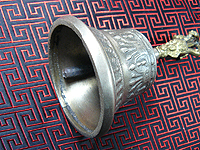 Bells are rung in ceremonies and meditation practice, and sometimes also sung with. 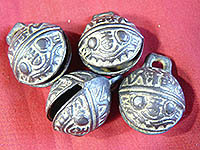 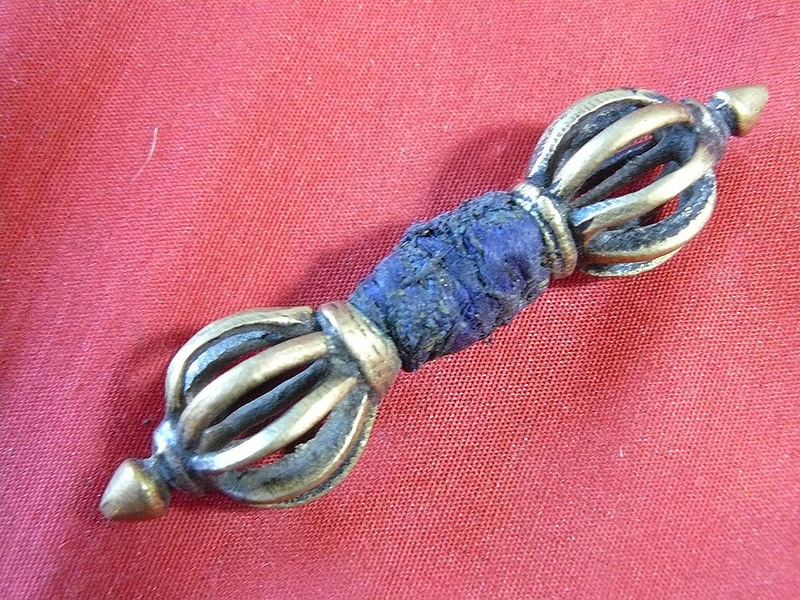 They may be also kept on an altar as symbolic objects and small versions of them are worn as sacred amulets. 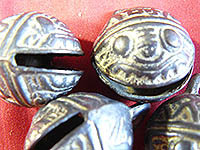 Dorjes come in both 5 and 9 pronged forms - the centre rod being included in the number. 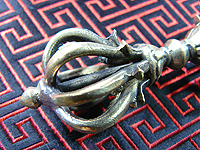 Generally 5 prong dorjes more resemble eagle claws. It is traditional never to polish bells as in Buddhism the female, empty state is concidered perfect. 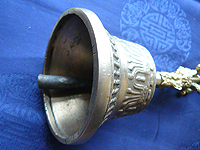 Other forms of bells used in both Buddhism and Shamanism include cynbals, and the thicker, small form of cymbal known as a tingsha. Tingshas may be in pairs or single. 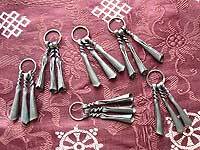 In Buddhism they are generally used to call spirits - called Hungry Ghosts - to come to ritual meals given as an act of compasson for them. 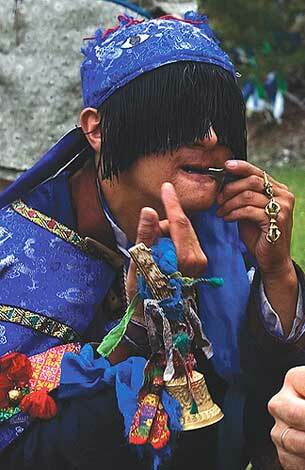 In Mongolian and Tuvan Shamanism they are used to call to the spirit powers to come to a ceremony and for other things. 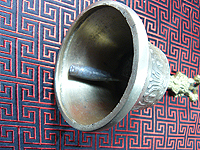 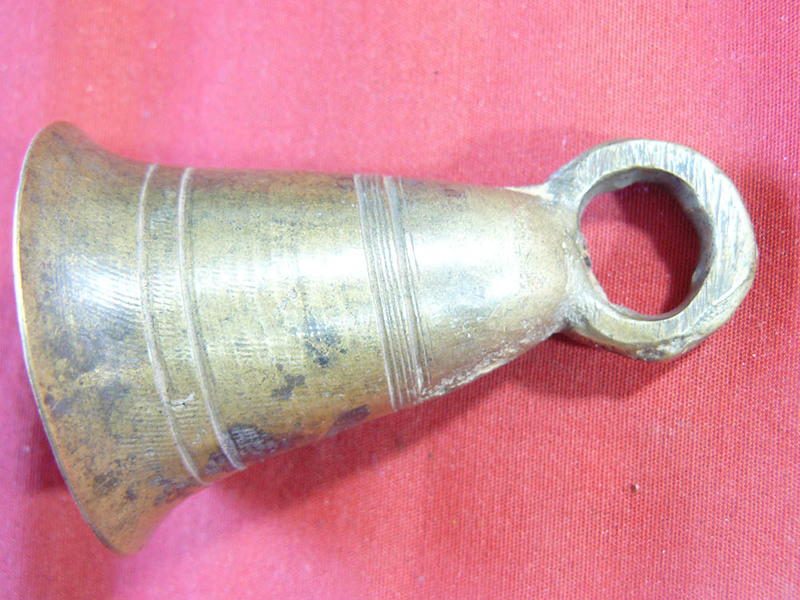 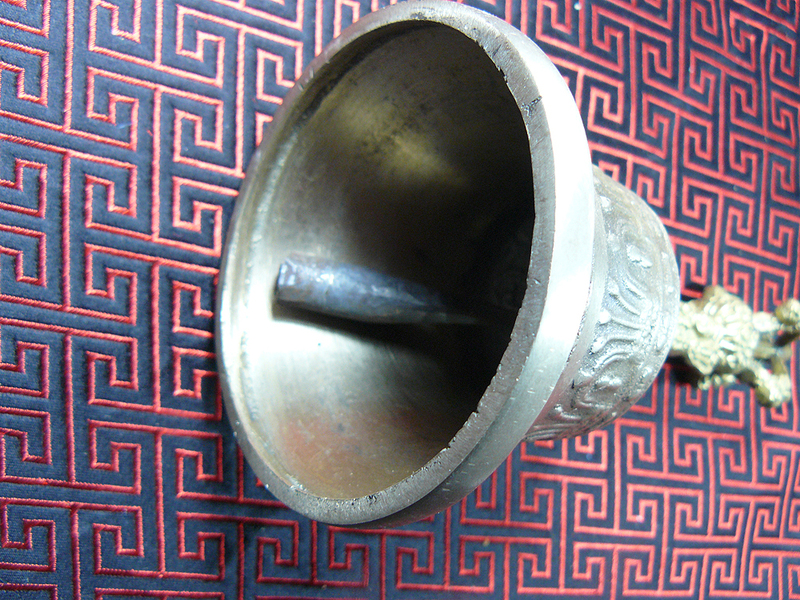 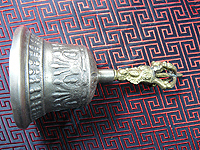 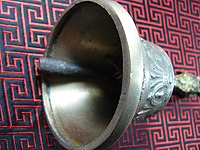 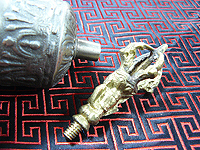 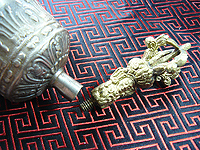 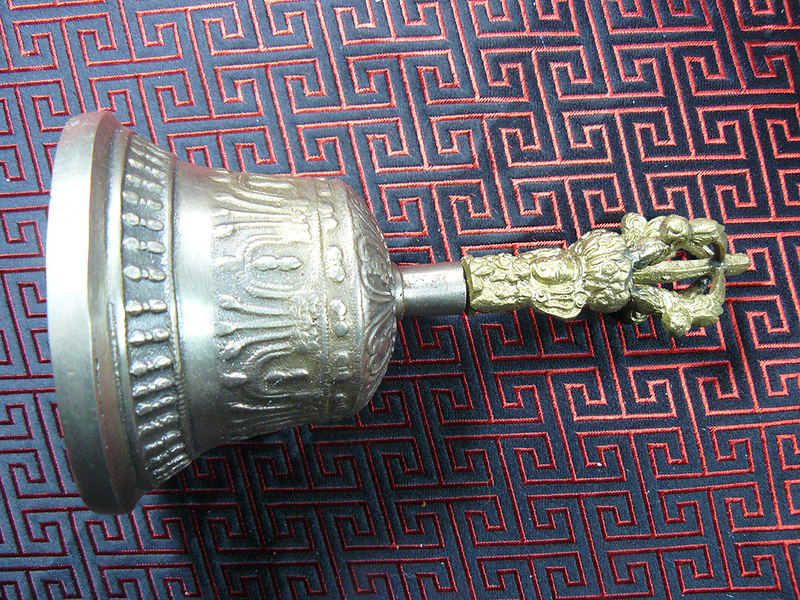 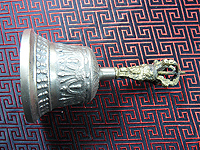 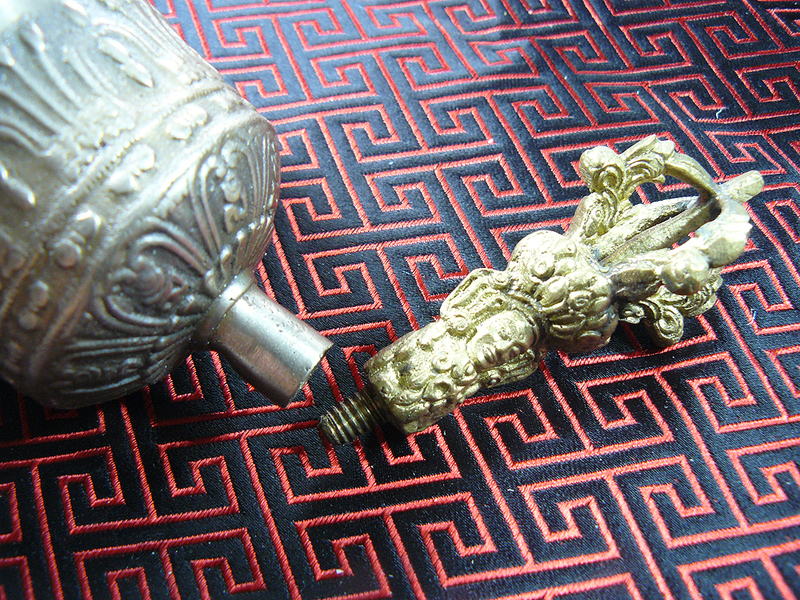 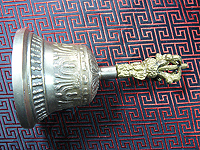 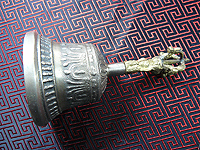 More information about the Tibetan use of bells and dorjes can be found in an article HERE. 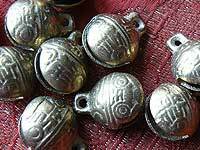 Shamans also use other types of bells, such as Jingle Cones and Tiger Bells, both of which can be found at the bottom of the page. 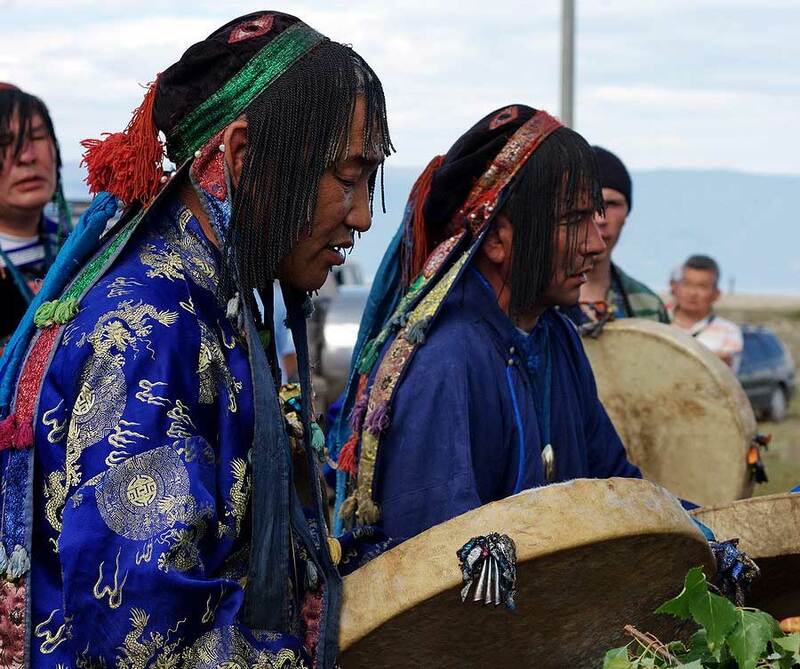 Below: Mongolian White Shamans with bells. 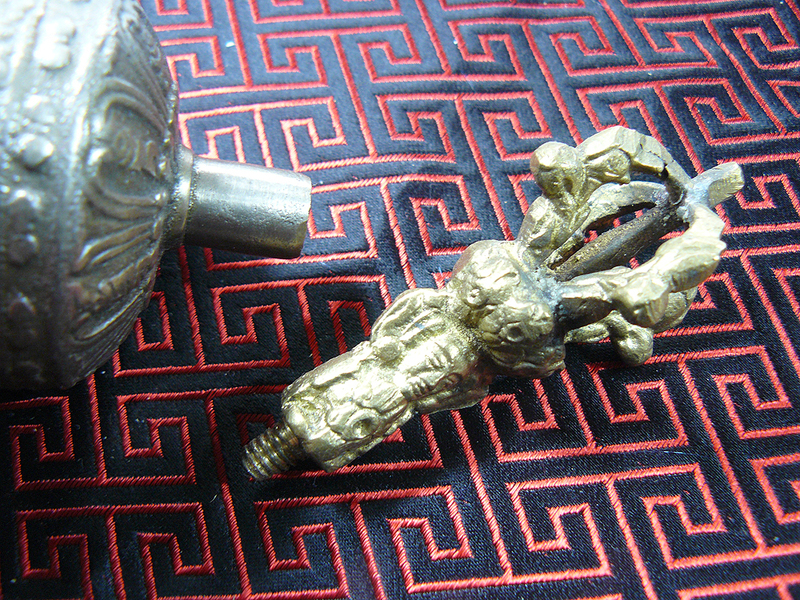 The one on the left is playing a jaw harp, which has a small dorje amulet hanging from it. 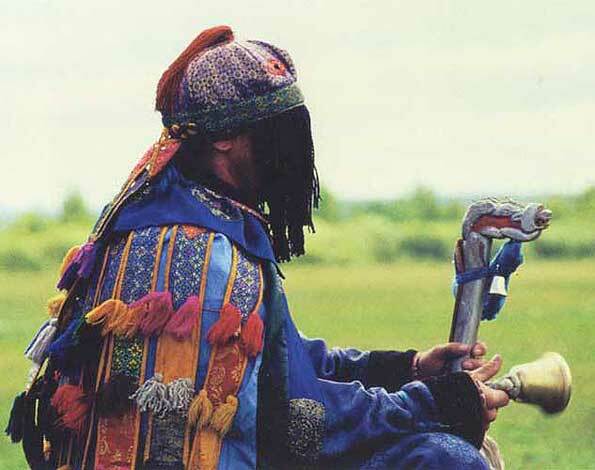 The one on the right is holding a White Shaman's dragon headed staff. 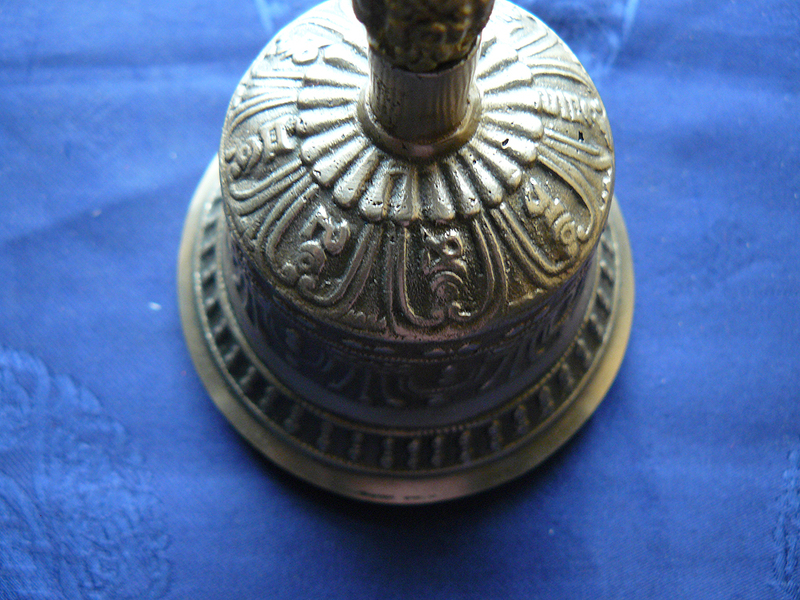 A recently made bell of good quality. 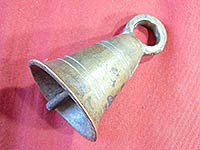 The bell has a sweet sound and long sustain. 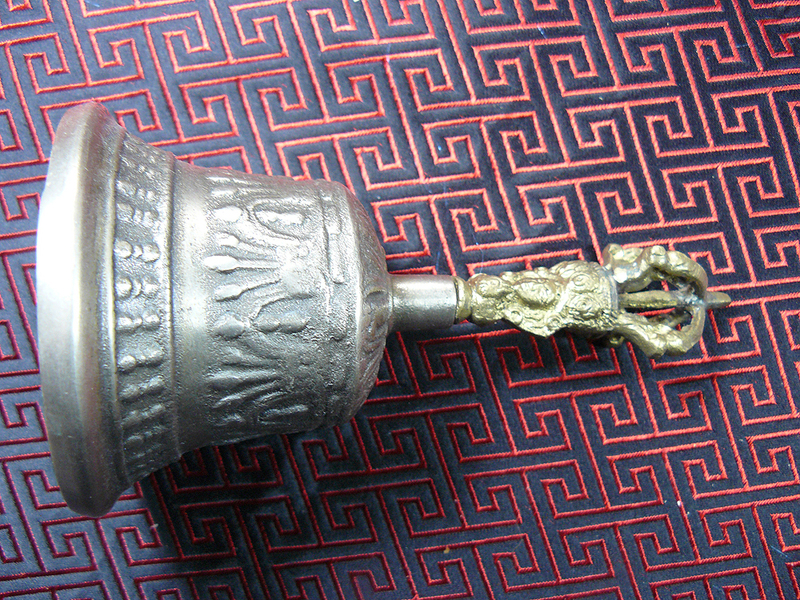 A recently made bell of good quality. 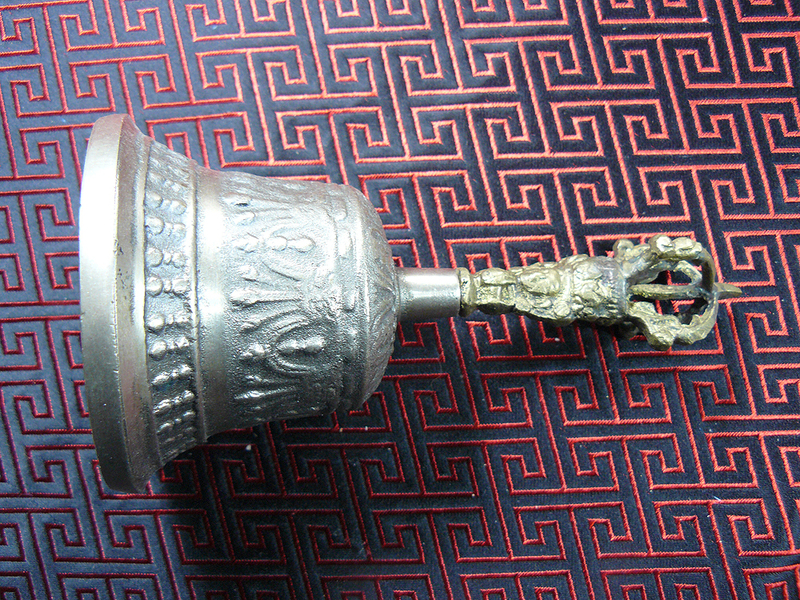 The bell has a sweet sound and long sustain. 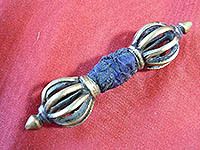 Small, nine prong dorje (eight and centre). 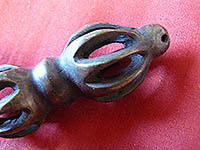 Excellent to use as a ritual object or added to a collection. Old five prong dorje with an origianl stiched on cloth binding over the central secrtion. 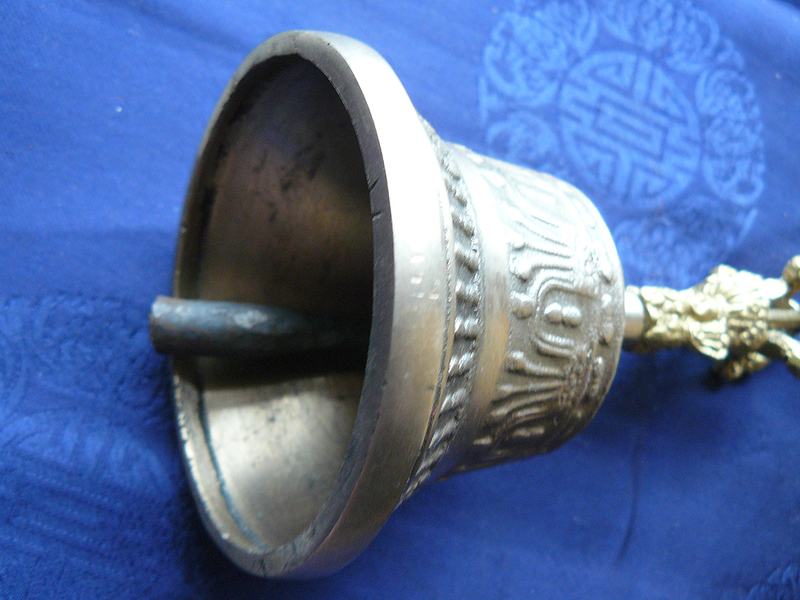 This would have been put on to make the dorje easier to hold during rituals. 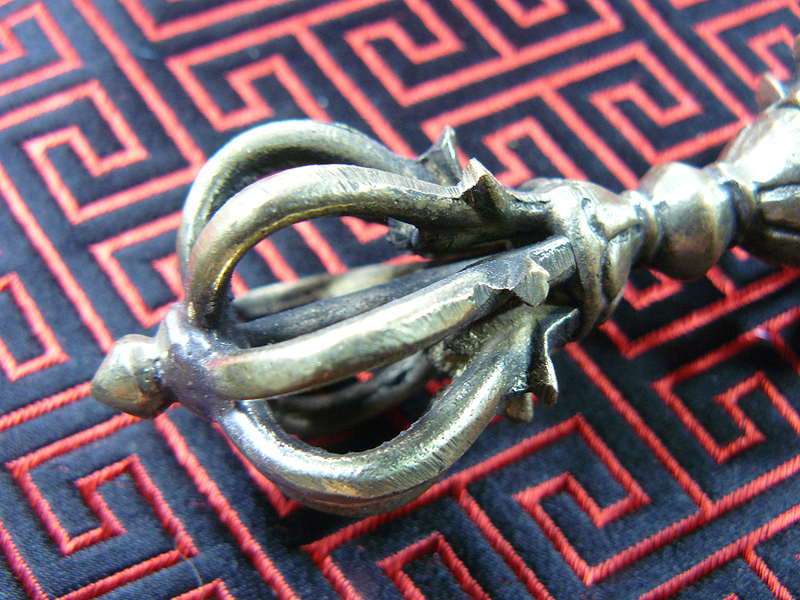 Old nine prong dorje with an origianl cloth binding over the central secrtion. 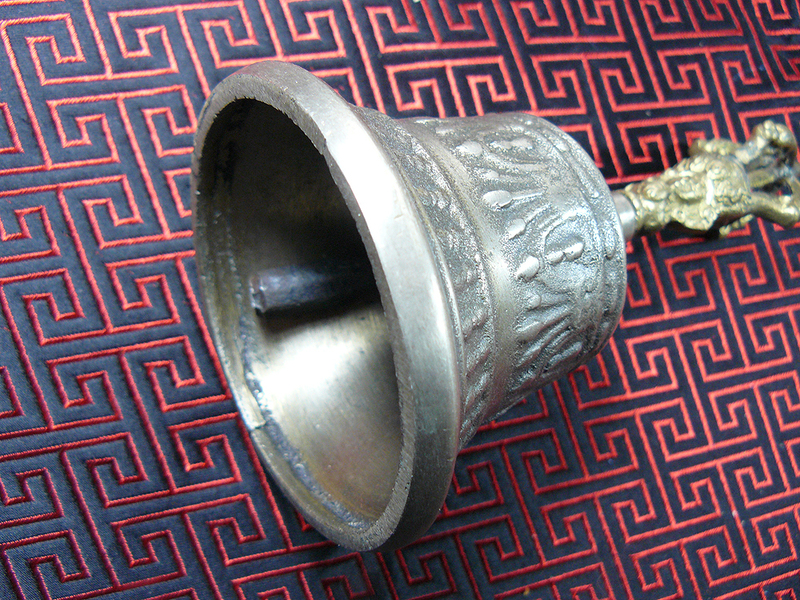 This would have been put on to make the dorje easier to hold during rituals. 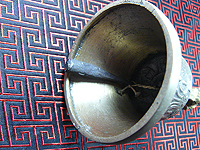 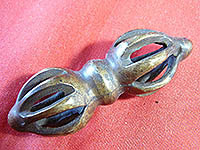 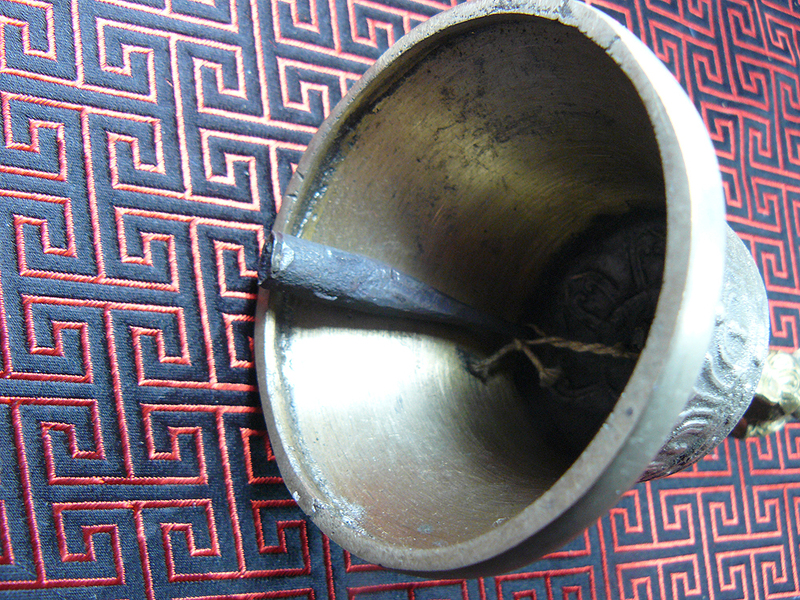 Old nine prong dorje with a suspention hole at the one end.